il·lu·sion·ism ( -l zh -n z m) n. Philosophy. The doctrine that the material world is an immaterial product of the senses. 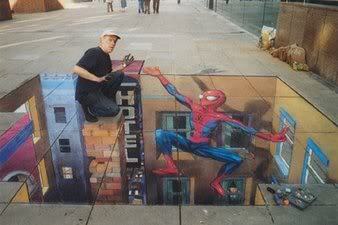 Julian Beever, whose amazing spidey sidewalk pic is at left, continually wows people with his artistry and imagination, tricking them into believing they’re seeing three dimensions instead of two. I think artists can learn a lot from musing about the other arts, especially watching and listening to the masters of those arts; and to me, the art of illusion is no exception. I recently saw David Copperfield make a stage full of people disappear within feet of my eyes. “Explain that one,” I said to my skeptical husband, who then admitted he was stumped. It was impressive, because of course the whole audience knew it was being had. Somehow. But Mr. C took us all down a merry road of his paving until there was no way to look at it except for the way he meant us to. When you think about it, a writer who transports readers into their world using only the written word is, in a sense, a literary illusionist. This doesn’t mean the story must be set in a world different than our own, though some could argue that fantasy authors such as J.R.R. Tolkien, Philip Pullman and J.K. Rowling are among the most gifted literary illusionists known to us. Every fiction writer creates a world they want readers to believe in, as well as nonexistent characters with imaginary problems they want readers to care about. So are there lessons for the writer hidden in the art of illusion? Let’s take a close look at the man Harry Houdini named himself after, Robert Houdin (1805-1871). Thus, for instance, when out on errands my hands could be at work on both sides; at dinner, I often ate my soup with one hand while I was learning to sauter la coupe with the other–in short, the slightest moment of relaxation was devoted to my favorite pursuit. Pursued by the notion, I ran and shut myself up, in my workroom, and was fortunately in that happy state when the mind follows easily the combinations traced by fancy. I rested my hand in my hands, and, in my excitement, laid down the first principles of second sight. … I fancied that this ‘perception by appreciation’ might be susceptible of equal development, if I applied its principles to the memory and the mind. Houdin decided to tackle the challenge as he had palmistry: by developing base skills. He and his older son developed keen visual memory over time as well as a secret means of communicating through telegraphy. After mastering these things, they took to the stage, where Houdin observed objects held by audience members and his blindfolded son made the correct guesses. The fashion an artist enjoys can only last as his talent daily increases. Houdin invented several curious mechanical items that relied on illusion, including a mystery clock whose inner workings were unknown and a writing/drawing automaton that could seemingly answer questions posed to it. He became famous for his inventiveness and for his ability to truly stymie his audience, pitting their eyes against their logic. It’s not so different with great fiction: we know we’re in the world of the author, but what we read seems so real that a part of our brain holds tight to that possibility. And that’s the key to great illusion. 1. Dig deep. Always ask yourself what would make the illusion that is your manuscript better, more authentic. 2. Hone your base skills. Try writing short stories and poems, for example, in order to test and stretch your ability to create believable worlds and characters, or to hone in on emotion. 3. Work in off-moments. “Write” in your head before trying to sleep, or while cooking, shopping or waiting in traffic. 4. Fantasize. As Houdin might advise, find that “happy state when the mind follows easily the combinations traced by fancy” in order to discover out-of-the-box territory where no writer has ever gone before. 5. Get critiqued. It can help you to learn exactly where your craft is weakest, prompting you to study more and more. 6. Work everyday. Mastery comes with regular craft work. You can read more of Xingjian’s speech, The Case for Literature, here. You can read more about Houdin in his memoirs, here. Check out some more of Julian Beever’s amazing sidewalk art (and other artistry), here. And a big thanks to him for giving his permission for us to use his super-cool spidey picture. And just for fun, you should check another cool treat, this dragon illusion video, here. today’s blog is excellent. very thought provoking. i greatly appreciate the tips at the end. duh…i keep forgetting to refresh my writing by practicing variety. very important.